TROOPER DAVID TITLEY SPEAKING ON THE WOUNDED WARRIOR DOG PROGRAM accompanied by his dog Bugley. David is a Pennsylvania State Trooper and a 25 year veteran of the United States Army. He tells about how a dog can make a difference in the lives of the veterans who have returned from the war. A dog has to have special training to match up with a veteran. The dog has special senses that humans don’t have and can provide special needs to a veteran after coming home from the war. 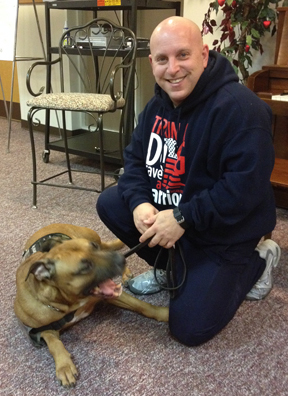 This entry was posted in Danna's Radio Diner Archive and tagged Dogs, Dogs make a difference, Post Traumatic Stress, Service Cannines, Trooper, United States Army, Veterans, Wounded warrior dogs. Bookmark the permalink.